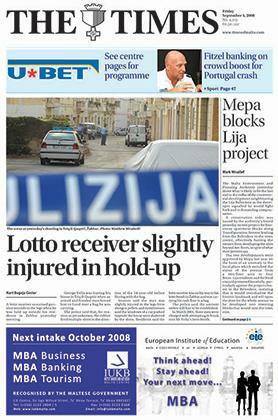 A lotto receiver sustained gunshot wounds to the legs when he was held up outside his residence in Żabbar yesterday morning. George Vella was leaving his house in Triq Il-Qaqoċċ when an armed and hooded man forced him to hand over a bag he was carrying. The police said that, for reasons as yet unknown, the robber fired multiple shots in the direction of the 54-year-old before fleeing with the bag. Sources said the man was slightly injured in the legs from shotgun pellets and eyewitnesses said the windows of a car parked opposite the house were shattered by the shots. The Malta Environment and Planning Authority yesterday drove what is likely to be the last nail in the coffin of the controversial development neighbouring the Lija Belvedere as the developer signalled he would fight back and is demanding compensation. A conservation order was issued by the authority’s board yesterday on two projects for four storey apartment blocks along Transfiguration Avenue. The three dolphins at the Splash and Fun Park finally have more room in which to flex their muscles. They were yesterday moved to a deeper pool. The transfer operation was carried out two weeks after a report in the Sunday Mirror said the dolphins were being kept in stagnant water and that they were being “boiled alive”. Pega, Budoan and Hitcha, as the dolphins are called, were being temporarily kept in a pool which was 1.3 metres deep. But the supposedly temporary wait was taking too long: work on a dolphinarium, consisting of a pool, two holding pens, was still unfinished. 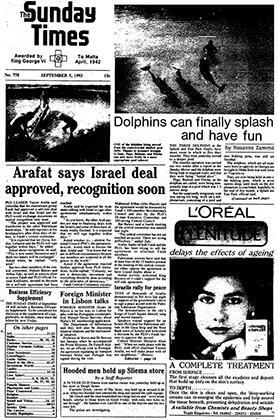 The dolphins, which are all male, were born in captivity in Georgia and brought to Malta from war-torn former Yugoslavia. A 54-year-old Sliema mini-market owner was yesterday held up in his store in Dingli Street. Carmelo Grech, owner of The Store, was held up at around 6.40am. A Sliema youth, Herbert Naudi, 19, was grievously injured and is said to be in danger of losing his life, after a car accident in Tower Road, Sliema yesterday. Naudi was a passenger in a car driven by Noel Frendo Jones, 21, also of Sliema, which was involved in a collision with another car driven by Norman Borg, 23 of St Julian’s. Frendo Jones was slightly injured and kept at St Luke’s Hospital for treatment. Through the impact, two parked cars were also damaged. A Bulgarian airliner crashed at the Black Sea Port of Bourgas last night killing 50 of the 89 passengers and crew aboard, the official Bulgarian news agency BTA reported today. The agency said the airliner, on a flight from Dresden, East Germany, crashed shortly before landing at Bourgas airport. 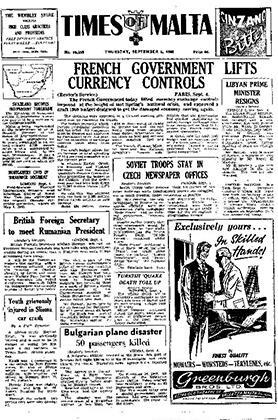 Weather conditions at the time were bad, the agency said. The disaster was the second crash of a Bulgarian airliner in less than two years.